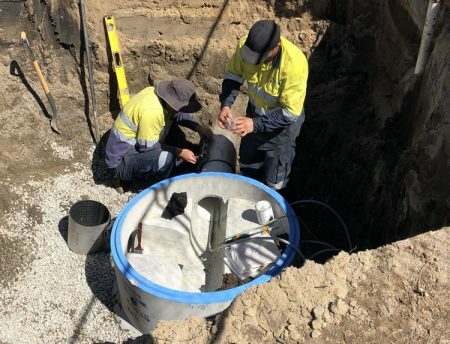 Leeuwin Civil was engaged by the new owners of Riverside Caravan Park on the Eaton Foreshore to install two new sewer connections at either end of the caravan park. 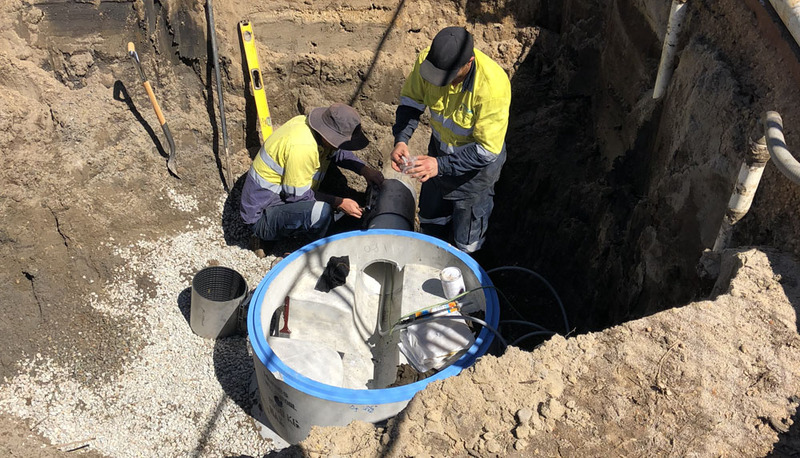 Works at Pratt Road included the supply and Installation of a new 150mm sewer and pit to be connected into the existing Water Corporation asset. This was achieved through open excavations and trenchless technology to minimise disruption to road users. Leeuwin Civil also worked in consultation with project stakeholders including the Water Corporation where they coordinated plug-in times to existing infrastructure so the new pit could be installed seamlessly. Dewatering and traffic management were used as controls to ensure the safety of road users at all times. Connection works at the Hamilton Road end included approximately 80m of trenchless technology running in front of the fire station. Original designs had the location of one of the pits within 2m of a Western Power pole. This would have meant Leeuwin Civil would have also had to engage with Western Power during works to ensure the protection of their asset. It was estimated that this process would have delayed the project by approximately 16-20 weeks. To mitigate this risk, Leeuwin Civil recommended a small design alteration that increased this distance enough to remove any risk to the asset, and therefore remove the need to consult with Western Power during works. The other design hurdle Leeuwin Civil had to overcome were existing Water Corporation asset flows at the design connection point, as it was cost prohibitive for the Water Corporation to alter, divert or tanker these flows. To overcome this issue, both parties agreed that the connection point was to be a cast in situ base. The manhole was then built-up with standard well-liners and the existing pipe that was carrying the live sewer through the new manhole base was “buzzed”. The manhole lid was placed and sealed. Leeuwin Civil’s proactive approach to all challenges presented on this project resulted in works being completed to the Water Corporation and client’s full satisfaction.